You’ll hear porcelain and ceramic being used interchangeably, but if you ask a flooring expert, they’ll be able to give you a more nuanced explanation of the two options. With a bit of research, you’ll find that these two types of flooring have more in common than you may think. Ceramic and porcelain tile are pretty much the same, except in one category — durability. The two are a part of a bigger category of tiles. Typically, manufacturers will classify tiles based on their specific qualities and either place them under the ceramic or porcelain classification. Rate of water absorption: Porcelain tile absorbs water at a rate of .5 percent, according to ASTM. It is also boiled for five hours before being placed in water for 24 hours. When it is weighed, if it’s less than 1/2 of one percent more from water absorption, then it will be called porcelain. Certification: The PTCA provides certification to tile companies to ensure that companies aren’t lying about the products they produce. Tile has to meet certain standards to be determined porcelain or ceramic. Placement: Ceramic can’t be used outdoors, stone is preferred but porcelain is sometimes used. Density: Porcelain has more density than ceramic. Durability: Porcelain is more durable than ceramic. PEI Rating: Porcelain has the higher PEI rating (5), making it useable for heavy residential and commercial traffic applications. Flooring experts at The Grout Medic understand all the strengths and weaknesses of porcelain, ceramic, and other types of tile. 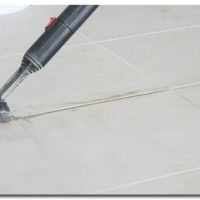 We repair, clean, and replace tile to help our customers get maximum life and enjoyment out of their tile flooring. 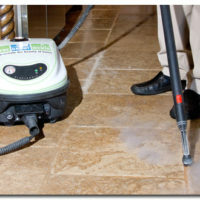 Contact us today if you have ceramic, porcelain, or grout that needs to be refreshed.